Finally, a game that’s not been played solo. I only managed to take some photos at the end of the game, but that’s a good sign – we got so involved in the game that I didn’t want to break off to take photos. For this game, the Union (me) were attacking across the river, while Nick defended as the Confederates. There were no woods on the table as we couldn’t find any reference to shooting ranges for into and out of woods, but we thought that 2″ would be appropriate for in and out, and maybe a 4″ range using the long range column on the shooting chart for 2 units firing at each other inside the same wood. In the centre the Union attack has stalled, while a Reb brigadier leads 2 fresh regiments into the attack. 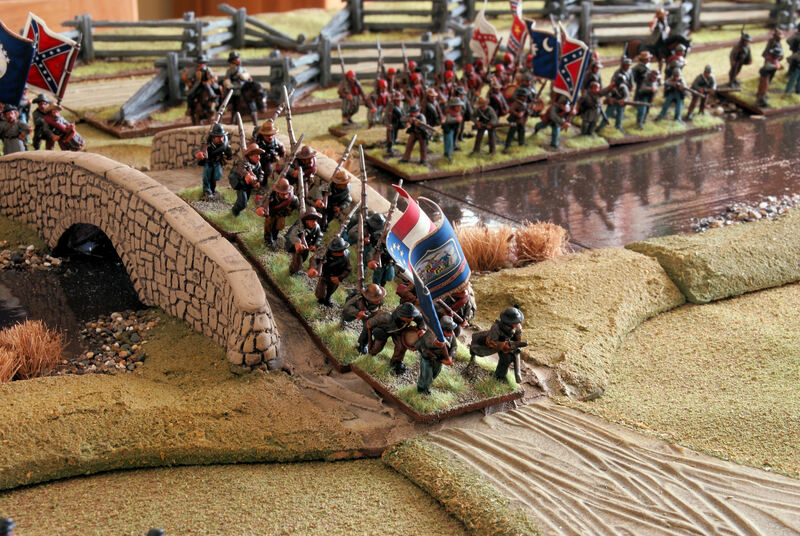 The Union only have 1 fresh regiment by the bridge, and it has been flanked by the victorious 2nd South Carolina returning over the bridge. In the left forground the 5th Texas have given the 7th Wisconsin a whipping and are chasing them into the 4th Maine, though have not managed to keep up with them in the pursuit. We ran out of time and didn’t get to play this interpenetration out, but as I understand it, next move the 7th Wisconsin will flee through the 4th Maine, and even if the 4th Maine pass their morale check and stand, they can’t perform any action this turn and must spend the first half of the next turn reforming, so can only fire (at reduced effect I assume), change formation or move half distance. This seems like a neat way of dealing with disorder without actually having a disordered condition. The Union general can be seen in the upper left of the photo – he is now leading this brigade as the Reb sharpshooters had put a hole in the brigadier’s head the turn before – luckily, all morale tests were passed (I guess he wasn’t that popular). The effectiveness of sharpshooters feels just right – as well as this brigadier taken out at the head of his brigade leading an assault , we also had a couple of close calls where the brigadier effectively just missed a turn of adding his command benefits but dusted himself off / got a bandage, to re-appear next turn. It really added a bit of spice to the game without being overpowering. In the centre is what remains of the 19th Indiana. They led the river crossing over the ford and covered the Wisconsin regiments coming behind them while they deployed. They have taken 90% casualties but are still passing their morale tests – this led to a bit of discussion as to whether we should have a house rule on units dispersing after they had taken so many casualties. Even if the 1st Maryland charged them at this point, if the 19th Indiana passed their morale check, the first round of melee would be 1 base against 1 base so they might even win the first round. On the left of the picture is the Union sharpshooter base, which kept taking potshots at the Reb right flank brigade commander, but failed to kill him outright, inflicting only light wounds, killing horses or putting holes in pocket bibles. The Union troops on my right flank had to drive the Louisiana Tigers out from behind a stone wall to enable the 116th Pennsylvania to charge across the bridge. The 29th Massachusetts led off across the river in skirmish order to minimise casualties, and they were followed up by the 63rd NYSV in close line. In a textbook operation, the 29th Mass. kept the rebs heads down, then redeployed on their flank to charge in support of the 63rd NYSV who had been joined by the brigade commander. Outnumbered and taken in the flank, the Tigers lost the first round of melee badly and fled automatically having taken more than 3 times the casualties they caused. 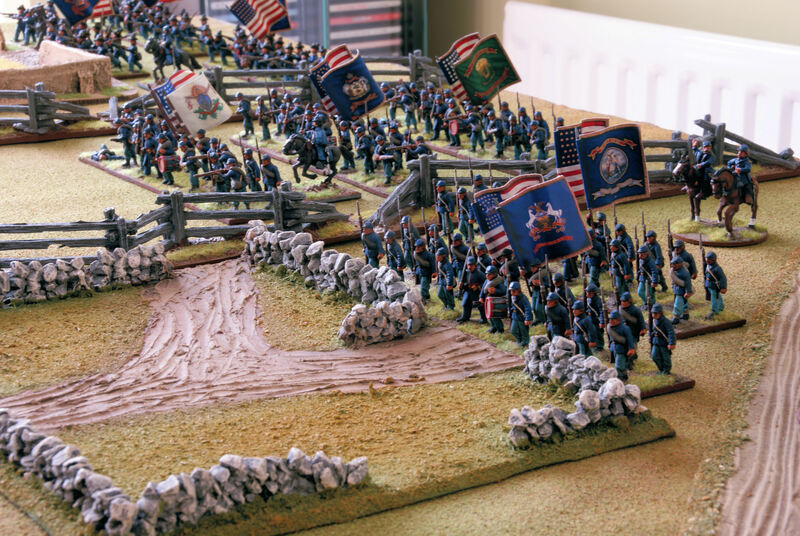 The 2nd South Carolina were charged by the 116th Pennsylvania across the bridge in turn 2, and there was a 3 turn melee, but as the 116th Pennsylvania lost 3 consecutive turns of melee, they broke and ran back across the bridge (and subsequently ran off the board) pursued by the 2nd SC. 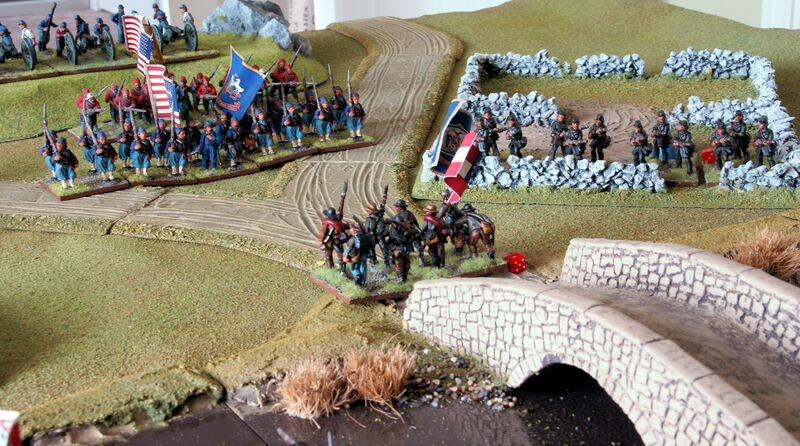 In the last turn, the 2nd SC were marching back across the bridge and into the rear of the Union position. With the Union winning on their right flank, but having their left flank turned, Confederates to their rear and fresh regiments appearing centre front, a Confederate win was declared. 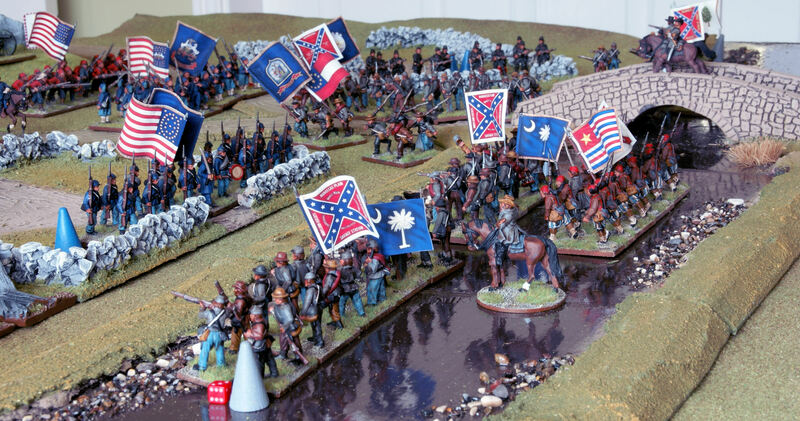 On reflection, we probably gave the Rebs too many troops (remember, I was the Union) – 11 regiments in 3 brigades for the Union against 9 regiments for the Confederacy. We had a few rules questions, but nothing we couldn’t resolve. The simultaneous firing is interesting – if you’ve taken casualties and are on your 3rd or more volley, then you’re unlikely to get even 1 die against a unit in cover, but you have to fire at them to deduct 1 dice from their attack dice – we ended up playing the firing at enemy troops (even if you end up with no dice to roll) gives them a -1 regardless – we judged it to be suppressive fire. Next time we will introduce cavalry to the mix, but the next game isn’t likely to be for a month or so, so back to trying out some other rulesets solo for me. I was able to play a game last weekend, the first for over 2 months. On top of the rules pile was “Bull Run to Gettysburg” by Dave Bickley published by Foundry, so ACW it was. A Confederate force of 3 brigades had to cross a river in the face of ever increasing Union troops – the Union had slightly more troops in 3 brigades along with some Sharpshooters, and both sides had a veteran brigade whilst the rest of their forces were tested. The rules are unusual these days in that there is no command and control mechanism, so you can move all your troops in a turn so long as their morale hasn’t failed. This certainly led to a fast game, as the Rebs immediately splashed across the river in an attempt to deploy before the bulk of Union forces arrived. There doesn’t seem to be a distinction between column of route and attack column in the rules, so the 1st Maryland piled across the only bridge in single file (an excuse to let me try out the firing and morale rules on the first turn). They were fired on by the Sharpshooters, the 76th Pennsylvania (Keystone Zouaves) and a battery of 3 artillery pieces. Firing works by giving each base firing a D6, then adding or subtracting dice for various factors – this reminded me of Warmaster (no bad thing). The sharpshooters get a base 4 dice, +1 for 1st volley, +1 for being under cover, -1 for being fired at in the turn (by the 2nd Mississippi wading across the river), so 5D6 needing 3+ to hit. The under fire modifier is a nice touch, as it encourages supporting fire, even if the Rebs did have to waste their precious 1st volley to do it. The Zouaves and artillery also fired at the 1st Maryland, and when the smoke cleared 9 Rebs were hit out of a regiment of 16, so clearly a morale test for losing 10% of the original unit strength in a turn. Morale is quite easy – roll a D6 and add or subtract modifiers. On 5 or greater (lower when rallying or pursuing) the unit passes. The Marylanders had +1 for advancing, +1 for support, +1 for brigade general within 10″, -1 for being under fire, -1 for being <50% of original strength, so a nett +1. They rolled a 2, so a total of 3 meant they had to halt – fair enough, though they were now blocking the bridge. Other units also had to take morale tests for coming under fire for the first time, so there was a raft of morale checks to take. These were mostly pointless, as a unit which is under cover or advancing gets +1, another +1 for being supported, +1 for having a their general with 10″ and +2 for having over 75% of original strength – so most units were starting off with 5 (or 4 if they were under fire) before a dice was rolled and would automatically pass (you need a result greater than or equal to 5 to pass). I suppose experience of the game would tell you when to even bother rolling the dice, but these first turn morale checks took a while. Both sides got bogged down in a firefight around the bridge, as the rules penalise firing after the second volley – another nice touch. 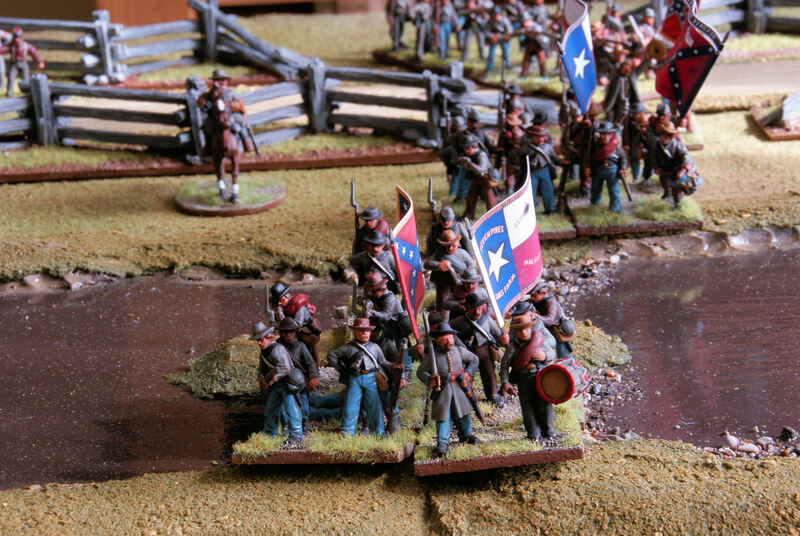 Further down the river the South Carolina and Texas brigades made good progress. 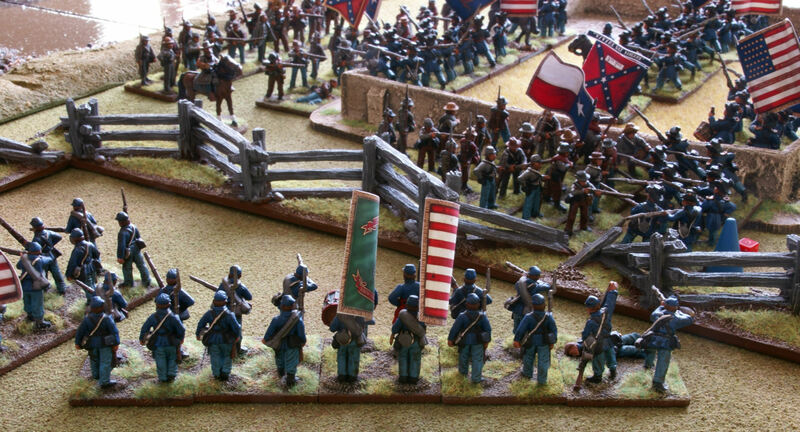 The 1st Texas made it to the field wall before the 7th Wisconsin, and both sides traded volleys. Next turn the 7th Wisconsin charged the 1st Texas behind the wall and the 5th Texas (still in column) charged the 2nd Wisconsin, so I had to go through the close combat rules for the first time. Firstly, the 7th Wisconsin had to test morale to charge, but as you add +2 for charging, +2 for being over 75% of original strength, +1 for veteran, +1 for support, +1 for advancing last turn and +1 for general and only have -1 for being under fire, the total of 7 meant an auto-pass even without the addition of a D6. They moved to within 2″ of the wall and were met with a volley from the Texans. 5 dice +1 for being under cover but -1 for being charged caused 3 casualties, so enough for another morale check but not enough to take the Union regiment under 75% – even if they had, they would still have been on 5 so couldn’t have failed the charge home check. 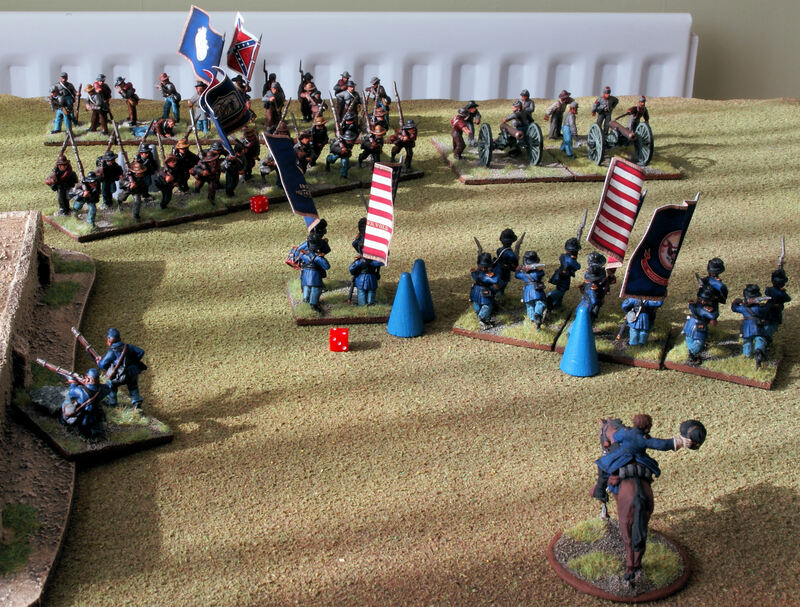 In the melee, both sides had 5 dice, but the Rebs got an extra dice for being behind the wall – it did them no good, as needing 5 or 6 to cause a casualty they failed miserably to roll any. The Union caused 2 casualties and the Rebs had to fall back allowing the Union over the wall, though they easily passed the morale check for losing the melee. The other melee where the 5th Texas charged the 2nd Wisconsin was a bit more complex – only 2 bases from the Wisconsin regiment were on this side of the field wall, but it wouldn’t have mattered as in the rules, only bases in frontal contact (not corner-to-corner) can fight in the first round of close combat, and the column was only 2 bases wide. However, the 63rd NYSV had wheeled in the last turn to fire at the 5th Texas in the flank as they charged the 2nd Wisconsin. Between the NYSV and Wisconsin volleys, 6 hits were caused on the 5th Texas. Even with that, they couldn’t fail their morale test to contact as they had +4 (the +1 for being veterans meant that even rolling a 1 wouldn’t result in a fail). 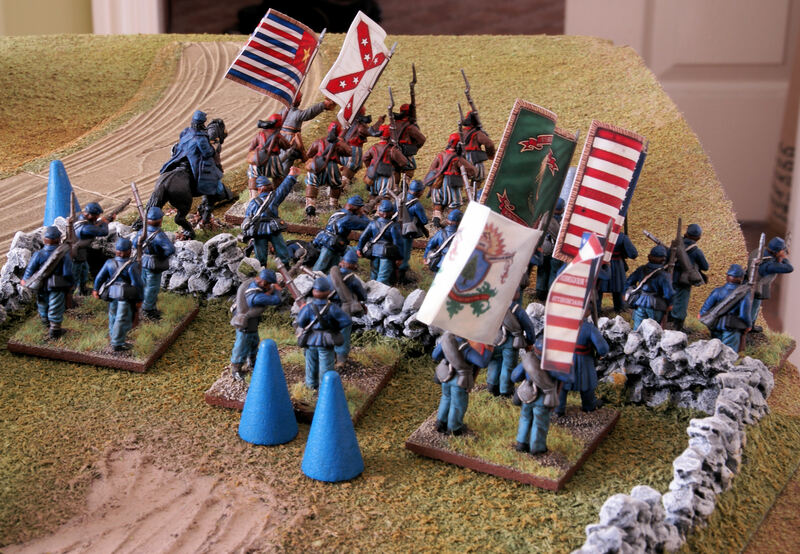 So each side started with 2 D6 and add 1 for being infantry fighting infantry in the open – the 5th Texas scored 2 hits to 1 and pushed the Union back, but again the morale test for losing melee couldn’t be failed. I had to call it a day there, but it looked as if the Union line was in danger of being ruptured by the 5th Texas, while the South Carolina brigade were winning the firefight in the centre. I really like the rules and the support from the author on the Lead Adventures forum is greatly appreciated. In the next game, I’ll be using snipers, a feature of the rules I like the look of. Given the morale minuses for losing a general in sight of your troops (never mind losing the +1 for having him within 10″), snipers may well be an essential balancing mechanism to the high morale values of troops with over 75% of their starting strength intact. Also, when 1 unit breaks or is destroyed, other units who witness it get minuses to their morale checks, so lots of potential for a total collapse if the dice land like they usually do for me!